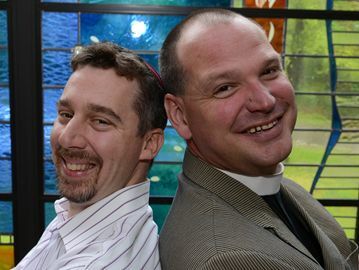 Rabbi Stephen Wise and Rev. Canon Darcey Lazerte did not make it on the reality show, The Amazing Race Canada, but they had fun trying out. To them, it was another way to continue to grow the relationship between their two faiths — and spread the word about interfaith co-operation. 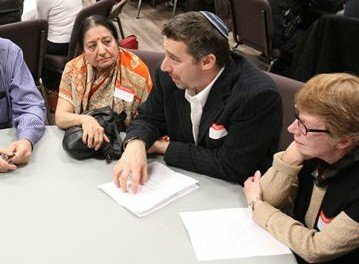 “We wanted to spread the word of goodwill and collegiality between the faiths, between the leaders of faith, and to take that message with us across Canada,” said Wise, leader of the Oakville-based Shaarei Beth-El Congregation of Halton. “It sounded like a lot of fun, too,” added Lazerte, rector of Oakville’s St. Simon’s Anglican Church. The two faith leaders filmed a video together and posted it to the video sharing website YouTube in a bid to get on the television show, which premieres July 15. They didn’t get on the show, but the pair doesn’t intend to stop spreading that show of goodwill anytime soon. 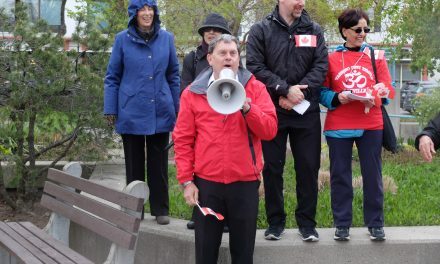 “I think we can do it here in Oakville and we have been doing it. We don’t have a national stage though,” Lazerte said. The two faith leaders have been friends for some years. They met shortly after Wise joined Shaarei Beth-El in 2007. Though Lazerte attended the rabbi’s installation, they didn’t really get to know one another until they met at another event and began talking hockey. It wasn’t long before the pair laced up their skates and began playing hockey together, competing in some friendly pick-up games. “It started as a friendly competition between our two congregations. We’ve had some time to learn together. We’ve had some time to play sports together,” Wise said of the friendship. Wise later joined St. Simon’s baseball team, which competes in a local interchurch league, and the team won the most recent championship. 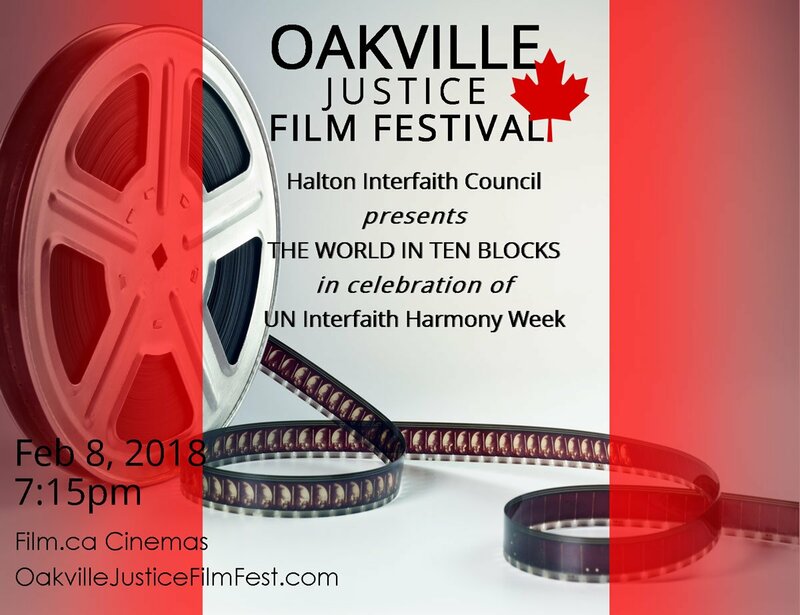 The two faith leaders say there is strong co-operation between the faith communities in Oakville and playing baseball is a great way for the groups to get together. Wise is also the chair of the Interfaith Council of Halton. Co-operation between Shaarei Beth-El and St. Simon’s is also evident in other ways — such as the time each leader lectured in the other’s service — and that connection will not end despite the lack of national exposure. “Whether we got on the show or not, our continued friendship and relationship between the two houses of worship continues,” Lazerte said. The two have also talked about doing mission work together or doing an interfaith trip to Israel. But, it was also fun to dream of being on a national television show. “I said, ‘What could be better than two leaders of faith trying to get together, competing together and going for it?’,” Wise said. The two and a half-minute video, in which they call themselves The God Squad, was shot at the local Legion hall and at St. Simon’s one morning. It features the pair talking about entering The Amazing Race Canada and then films them as they go through a series of physical activities, including weight lifting the Bible, arm wrestling, jogging up and down stairs and dancing the Horah, a traditional Jewish dance. “It works the waist and the lower body,” Wise said of the Horah. Lazerte said his favourite moment from the video was the dance. For Wise, it was watching his friend dance the Horah.